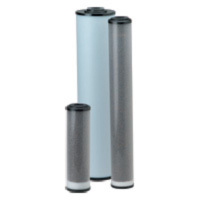 Specialty Filter Cartridges can be used for a number of different applications ranging from scale and rust inhibitors to iron reduction and oil adsorption. WS Series Filter Cartridge is designed to allow optimal contact between water and resin surfaces, ensuring maximum ion exchange. The internal expansion pad minimizes channeling while the post filter eliminates any potential for bypass. Designed for low water usage, these units will easily deliver softened product water through the use of FDA-grade sodium based, non-solvent rinsed softening resin. The cartridge style design provides a convenient solution for delivering softened water to protect sensitive water delivery equipment. MicroGuard™ Membrane filter provide reliable bacteria and protozoan cyst reduction for safer and cleaner drinking water without incorporating chemicals into the media or adding chemicals to the filtered water. 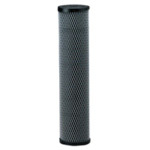 The MicroGuard carbon block membrane cartridge, MG-10MCB, is uniquely designed with integral carbon block and sediment pre-filtration for the reduction of chlorine taste and odor and for providing extended life of the internal membrane element. This cartridge has 2.5 times greater filtration surface area than some anti-microbial carbon blocks and operates at a higher flow rate with lower pressure drop. This makes the MG-10MCB ideal for Point of Use (POU) applications. 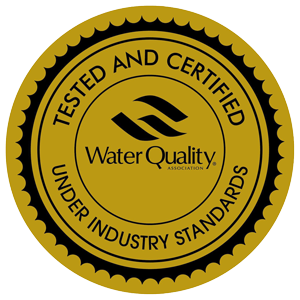 The MicroGuard cartridges do not require USEPA registration and their effectiveness is not susceptible to common substances normally found in some water, e.g., hydrogen sulfide, natural organic matter (NOM) and total dissolved solids (TDS). PCC Series Filter cartridge contains food-grade hexametaphosphate that dissolve slowly in water to inhibit scale and rust build-up. RFFE20-BB Filter cartridge is designed to provide an easy and effective method of reducing iron from water, which greatly improves the taste. This cartridge helps to eliminate the orange and brown stains often found in sinks, toilets, tubs, and other plumbing fixtures. 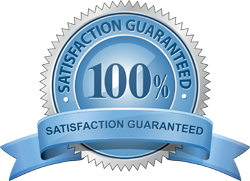 It also reduces the possibility of damage to pipes and water heaters and reduces up to 3 ppm dissolved iron. It adds no harmful chemicals to the water, making it completely safe for drinking water applications. 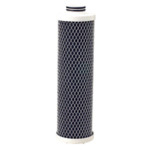 PCF Series Filter cartridge has been developed in response to the requirements for di Ionized water in many industries. 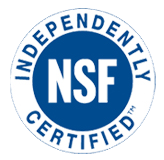 They are manufactured using an FDA-compliant resin that has been subjected to additional post-production steps to minimize the total organic carbon (TOC) level. These high-capacity, semi-conductor-grade resin cartridges are ideal for use in pharmaceutical and medical laboratories, cosmetics and circuit board printing applications. 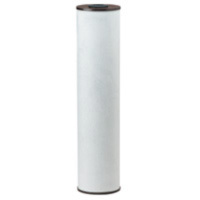 OAC-20BB: Filter cartridge is made from modified cellulose-based filter media which is processed into sheets and assembled into cartridges for use in PENTEK 20-inch Big Blue filter housings. Polypropylene bags are compatible with a broad range of corrosive fluids including organic solvents, oils, acids, alkalies and micro-organisms. 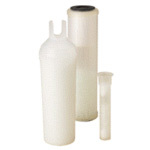 BP Series (Polypropylene Felt) Bags - An assortment of filtration ratings is offered from 1 to 200 microns - to comply with any filtration requirement. The bags are manufactured from felt due to its high solids loading capabilities, in comparison to similar mesh fabrics. The media is created by needle-punching two layers of synthetic fibers together in a supporting scrim. A glazed finish, created by melting the outermost surface fibers, is used to produce a bond that reduces the possibility of migration. BPHE Series (High Efficiency) Bags - High efficiency bags are offered for those critical applications when high efficiency combined with high dirt-holding capacity is required. Polypropylene materials are processed into microfibers with diameters of 1-10 microns or more. These fibers are converted into filter material. Microfiber media are covered with spun-bonded polypropylene. 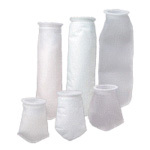 BN Series (Strainer) Bags: Woven mono filament materials are offered in nylon with micron ratings of 50-800 and efficiencies from 75 to 95 percent. The materials are cleanable and reusable. • Higher productivity - faster bag "change-outs"